When it comes to concrete cutting, we have the ability to handle every scenario, whether it’s wall, slab or asphalt sawing. Flat sawing, the most commonly used diamond cutting method, is typically used to cut horizontal flat surfaces such as floors, bridge decks, and pavement. Also called slab saws, flat saws feature a diamond blade that is mounted on a walk-behind machine requiring only one operator. Our saws can cut up to 24″ in depth. 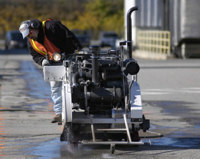 Flat saws are typically used to provide expansion joints, remove damaged pavement sections, clean and prepare random cracks for repair, and remove concrete sections for demolition purposes. For wall sawing, we use a diamond blade on a track-mounted system that can be used for vertical and horizontal cuts. This setup can also be used on steep inclined surfaces where a slab saw cannot be used safely. Wall sawing is typically specified to cut precise openings for doorways, ventilation units, windows, bulkheads, and loading docks. Wall sawing causes no vibration or damage to the remaining structure. A wall saw can be equipped with a flush cut attachment. This allows us to make cuts flush to perpendicular slabs, walls, ceilings, etc. A wall saw can do bevel cutting. Hydraulic chainsaws are used for “no overcut” requests on corners. Wall saws are lubricated with water to provide for dust free operation. Our wall saw trucks are fully self-contained, carrying all tools, equipment, power and water necessary for the job.